The ProForm Performance 1800i Treadmill is a heavy duty treadmill loaded with features. The quiet and smooth ProForm 1800i treadmill features a powerful 3.5 HP motor ( Mach Z Commercial Plus Motor), which can reach speeds up to 12 miles per hour (in increments of 0.5 mph). The treadmill can incline between 0 (flat) to a 15 percent grade (powered). A rare feature on this treadmill is 3% decline grade. Decline simulates running downhill, and works out a different set of muscles. You can easily store the ProForm 1800i as it folds up. The exclusive EasyLift™ Assist with a hydraulic lift system to assist you when raising and lowering the deck. Running deck area is a large 22″ x 60″ for running, jogging or walking. 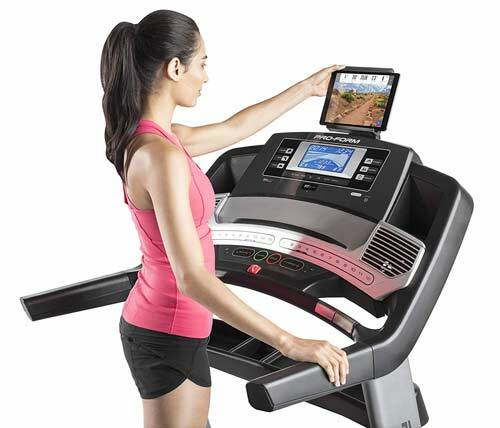 The ProForm 1800i home treadmill has 32 workout programs. iFit Enabled Technology – gives you access to virtually unlimited workouts, which were designed by certified personal trainers. Global Google Maps™ Routes. (iFit membership, sold separately). QuickSpeed® buttons for quick adjustments. The 7-inch backlit display will show your workout information such as incline level, heart rate, power in watts, speed of walking belt, elapsed time, your pace, calories burned, and distance completed. 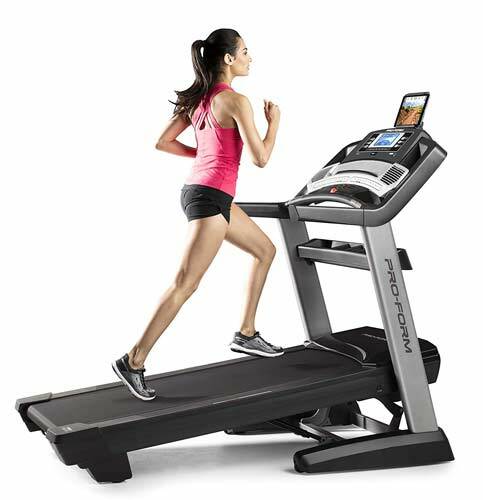 Proform Performance 1800i Home Treadmill Features: Other features include ProShox™ Deck Cushioning (provides shock absorption and support). Grip Pulse EKG™ Heart Rate Monitor, and included chest telemetry heart rate belt, and Dual CoolAire™ Workout Fans (keeps you cool during your workout). Tablet Holder (tablet not included). The console allows you to monitor your time and goals. Features stereo speakers which you can plug in your iPod® or MP3 Player to play through. Water Bottle Holder, Integrated Tablet Holder. Smart-Review Commentary: The ProForm Performance 1800i is a good heavy duty treadmill with many of the latest features and an excellent warranty. It is suitable for walking, running, and jogging. Since it folds up, it is ideal for areas where you can’t leave the treadmill open at all times. Folding is easy, thanks to the EasyLift™ Assist hydraulic lift system. The Proform 1800i treadmill has a strong 3.5 HP motor, allowing up to a 300 lb. user, which is good for this price range. An underpowered motor on cheaper treadmills will strain and burn out faster. This treadmill has a -3% decline grade setting, so you can run downhill. This feature is rare to find in treadmills, and will build up different muscle groups. The Treadmill is fully loaded with features including 32 workout programs, Power incline, iFit, Cooling Fan, Built-in Speakers, and a multi-feature console. A tablet holder allows you to entertain yourself while working out, and can hook into the ifit program with the ifit app. 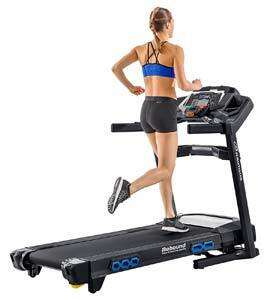 The 60-inch running deck and strong 3.5 HP motor make this treadmill suitable for both runners and taller users. The feature loaded ProForm Performance 1800i is a Smart-Review Top Pick and a great value for the money for mid-range level treadmills. -3% Decline Is this the best price? The Nautilus T618 is an excellent heavy duty treadmill under $1500. If you upgrade to the T618, you will get a treadmill with a powerful 3.5 hp continuous duty motor, large running deck (20 x 60″), high weight limit (350 lbs. ), better cushioning, 26 workout programs, built-in speakers & cooling fan, and a long warranty. The T618 has received excellent reviews. The T618 treadmill is our “BEST OF 2019” for treadmills under $1500.